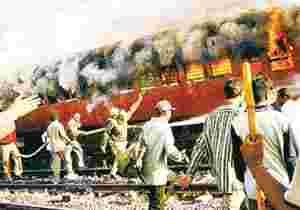 Painful past: A file picture of firemen and others trying to put out flames in a train torched by a mob in Godhra in February 2002. Ahmedabad: The cellphones of Bharatiya Janata Party (BJP) volunteers in Gujarat trill with songs of homage to the achievements of chief minister Narendra Modi, set to the notes of traditional folk music. “There is development! There are better roads! And the chief minister is the son of the soil! A strong man and decisive!" the ring tone sings, looping over and over, until someone picks up. Modi’s party has chosen the theme of economic progress as its key campaigning tool as it prepares for crucial state polls that start on 11 December. Five years after more than 1,000 Muslims were killed here—beaten, hacked and burned alive—as riots swept through this state, the shadow of the Gujarat carnage hangs over the election campaign, but is barely mentioned, with both Modi and the opposition Congress party wary of confronting the subject head-on. Political opponents, and even members of his own party, describe him as a ruthless, authoritarian leader. The Supreme Court, in a 2004 judgment on the riots, which happened while Modi was already chief minister, censured him as “a modern Nero who watched while Gujarat burned." A year later, the US revoked his visa on the grounds that he was responsible for “severe violations of religious freedom". Modi’s image makers have advised him to rebrand himself. When he last sought re-election, in 2002, soon after the riots, he fought on a platform of Hindutva, the trademark Hindu nationalism of the BJP. Now he is at pains to promote a more acceptable face. Everything about the campaign is deliberately modern, showcasing a new India and a “vibrant" Gujarat. In addition to the ringtones, multimedia volunteers have uploaded clips of Modi’s most rousing speeches on YouTube. Analysts say the Hindutva card will be played only if all else fails. Modi’s government has hired the American lobbying firm Apco to promote the attractions of Gujarat to international investors. Relations with the US, however, remain strained. Some 40% of all Indian-Americans in the US are from Gujarat originally, according to the US embassy, but officials said that, even if Modi became party leader, it would be difficult to see how Washington could change its stance towards him. The Congress party is also wary of campaigning on the issue of the riots for fear of alienating its own Hindu supporters. The party’s leader, Sonia Gandhi, described Modi’s government as “merchants of death" in a speech last week, but local politicians are under instructions to focus on rebutting the development claims, noting that large numbers of Gujarat farmers have fallen so deeply into debt that they have resorted to suicide, and arguing that the fate of the aam aadmi—the common man— has worsened. Last week, flanked by two new shopping malls and surrounded by images of lotus blossoms, the party symbol, Modi began his campaign with a speech to party workers, instructing them that he should be judged on the state’s economic achievements. Beneath the watchful eye of armed guards in black uniforms and berets, he raised a silver sword above his head and shouted: “I am passionate about Gujarat! Gujarat will win!" “Communal harmony has been restored in a nice way," he said. “In the last few years brotherhood has developed between Hindus and Muslims." This is not an argument subscribed to by the human rights campaigners who offer support to the state’s 9% Muslim population, many of whom now live in ghettoes away from Hindu areas of Ahmedabad. “There is an apparent feeling of normalcy, but there is an underbelly of hate and prejudice and violence which can explode at any time," said Jesuit priest Cedric Prakash.“It is a big lie to say that the state has not been polarized. You cannot be a Muslim and buy a house or a business or a shop in an upmarket part of the city. No one will sell it to you." The rehabilitation homes for Muslims who lost their houses and businesses in the riots are clustered on the city’s edge in the colony of Citizen Nagar, cloaked in haze from a massive waste dump smoldering barely 50 yards from their doors. The air is foul-smelling; parents say their children are plagued by respiratory ailments. Paid for with donations from Muslims in south India, the dwellings lack piped water, sanitation, roads and easy access to schools, health care and jobs. Water is pumped by hand from the ground, and residents believe it is tainted by chemicals from the dump. Feroza Banu, 22, whose husband was shot and killed by the police during the rioting, was angry that the massacre had been removed from the political agenda. “I believe that the government was responsible for this," she said.